Some of Menlo Park's tickets can be ignored. If your "ticket" does not have the Superior Court's name and address on it, it is what I call a "Fake Ticket." For more details, see the Fake Ticket section on the Your Ticket page. If you have a ticket from Menlo Park - even one you already have paid - be sure to read the "San Mateo County Information," which is Docs Set # 4 on the San Mateo Documents page - and contact me! Special note: At a meeting on April 9, 2019 the council will be deciding whether to continue the red light camera program. See Set # 4, below. Sen. Hill hosts frequent Java with Jerry events around his district, which includes the red light camera cities of Millbrae, San Mateo and Menlo Park. For information about attending a Java with Jerry event, see highwayrobbery.net's Millbrae Docs page or phone Hill's office at (650) 212-3313. Please also consider contacting the Menlo Park city council and chamber of commerce, and also the state senator and assemblyperson for the district in which you live. Also see ticket counts in Set # 2, below. Except where noted otherwise, totals and percentages are as provided by the City. This annual total, or annual projection, is by highwayrobbery.net. 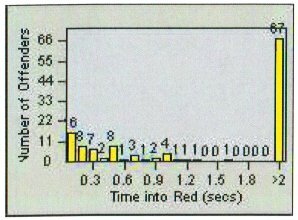 Any figures in red type (or, if you are looking at this table in black and white, the upper figure when there are two or more figures in a cell) are what the CMR calls Total Violations (total incidents photographed by the camera), and due to time limitations may have been posted here only for selected months or locations. If there is sufficient public interest, the remaining months will be posted. The figures in black type, Total Notices Printed, are believed to represent the sum of genuine citations issued (those filed with the court) plus the Nominations mailed (not filed with the court, a.k.a. Snitch/phishing/fake Tickets). If you have a left turn ticket at Bayfront/Willow, see the expanded version of Defect # 9 - C, and Docs Set # 3, below. Per City staff, a defective sensor at Bayfront/Willow was replaced on 11-22-10. It may have been responsible for the low number of violations recorded during September and October. Citywide total for this month is by highwayrobbery.net. According to the MPPD, the cameras on were inoperable because the re-paving on El Camino destroyed the in-ground sensors, and damage by a hit and run at Bayfront/Willow. This report was generated just a few days after the end of the month, so the number of tickets issued may be low. In late 2016 the City installed a camera at Bayfront/Chilco. See Sets # 4 & 9, below. The annual figures in black type are full year totals, or projections, of all Notices Printed (including those for rolling right turns), and are by highwayrobbery.net. The figures in blue type are full years totals, or projections, of rolling right turn tickets issued. For years 2009 - 2012 they are from a table prepared by RedFlex, and for 2013 onward they are from the annual reports required by CVC 21455.5(i) - which are published around late Summer of the following year. The annual report for 2016 revealed that 66% of the 3727 tickets actually filed were for rolling right turns. Highwayrobbbery.net requested invoices and/or revenue figures only for selected months. To see the official documents, see Ticketing Highlights and Set # 7, both below. Highwayrobbery.net's estimates based upon first 22 days of May. Highwayrobbery.net's estimate based upon first 27 days of February. Ticketing Highlights - Is There a Quota in Menlo Park? March 2018 internal correspondence (from a MPPD commander to the traffic sergeant) showed the City was watching the ticketing, and the money it generates, closely. This email was obtained from the City on 4-27-18 via a public records request. Commander Dixon's email produced results. Ticketing jumped in May 2018, to the highest since Jan. 2009, and in June, July and August 2018 it was higher yet. By any measure, the increase seen in May - August is significant. 1. It is 66% higher than the ticketing seen in January - April 2018. 2. It is 55% higher than the average ticketing seen in May - August of 2016 and May - August of 2017.
seen in May - August, there will be 8107 tickets in 2018, 37% higher than in 2017. 4. If the increased ticketing continues in 2019, there will be 9351 tickets by the end of that year, 58% higher than in 2017. In 2013 emails the MPPD traffic sergeant asked RedFlex if the high percentage of right turn violations predicted at a proposed new camera location would be "sustainable." (The answer was yes.) Details are in Set # 9, below. In late 2015 the City tripled the number of tickets from camera ECRA-3, which monitors El Camino northbound at Ravenswood. In one of those months 58% or more of the violations flashed by that camera were for rolling right turns (see the Aug. 2015 Late Times graphs in Set # 2, below). The extra right turn ticketing by ECRA-3 more than compensated for the reduction in straight thru ticketing caused by the longer yellows that were required beginning Aug. 1, 2015 - see Defect # 2. The extra ticketing by ECRA-3 could be quota behavior by both RedFlex and the police; RedFlex is able to lower the threshold speed (also called "trigger speed") to cause the camera to flash more of the drivers going around the turn slowly, and the police have the discretion to issue tickets to slower drivers - or to refuse to do so. Around the same time, RedFlex granted $17,985 of "Performance Concessions" to the City. Those discounts appear on some of the late 2015 invoices from the company to the City - and are posted in the table, above. The invoices do not indicate why RedFlex granted the discounts. The annual report (see footnote  above) for 2016 revealed that 66% of the 3727 tickets actually filed were for rolling right turns, and that 2016 right turn ticketing was more than eight times the rate in 2014. The City has provided bar graphs of Late Times, etcetera, for all four of its cameras. In Dec. 2016 and July 2017 the City claimed it no longer had access to the late time graphs. On July 2, 2010 at 10 a.m. CalTrans lengthened the yellow for the westbound Bayfront/Willow left turn to 3.5 seconds, up from 3.0. As a result, violations dropped by about 80% - see the Ticket Counts table, above. Flipping these numbers over, we can see that the missing half second increased ticketing fivefold. At Bayfront/Willow, approx. 3000 drivers were ticketed unfairly. Approx. $1.3 million in fines. If you have a pre-change ticket with a Late Time of 0.60 second or less, call the City and ask them to dismiss it. And if they refuse, take it to court. 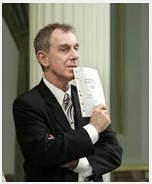 See also a letter highwayrobbery.net wrote to the local assemblyman (who was elected to the State Senate in Nov. 2012). It is also interesting to note that between February and March 2010, something caused the number of raw violations at Bayfront/Willow (in the table above, the figures in red) to double. And, it happened again between May and June of 2012 and again in early 2016. The city council approved a five year contract with RedFlex on Dec. 5, 2006. The 2006 contract included an illegal "cost neutrality" clause, whereby the city did not have to pay RedFlex the full rent if the fines weren't sufficient to cover the monthly rent. See Subsection B. of Defect # 10. The 2006 contract also said: Definitions. "Warning Period" means the period of thirty (30) days after the Installation Date of the first intersection approach. (Emphasis added.) See Defect # 6. The 2006 contract expired in May 2013. In May 2013 the City and RedFlex signed an agreement to continue the program for two months, to allow time for contract negotiations. At the June 11 council meeting the council approved a further two-month extension, terminating Sept. 2. The proposed long-term renewal was brought before the council at its meeting of Aug. 20, 2013. Included in the staff recommendation was the deletion of the previous Cost Neutral payment arrangements (see Exh. D in the contracts) and the addition of cameras at Bayfront/Chilco - See Set # 9, below. At the Aug. 20 meeting the city council heard after-midnight public testimony (from highwayrobbery.net and others) questioning, among many things, the price (the staff report recommended accepting a monthly rent, per camera, of $5397.50), and an unusual requirement for a supermajority 4/5 vote in order to cancel on short notice. They also received a new report (prepared by SaferStreetsLA.org) which examined the Menlo Park program in great detail and concluded that the program was ineffective and had not been justified in the first place. The city council continued the matter to the meeting of Aug. 27, at which time they approved the new contract (4 - 1, Carlton dissenting) including the addition of cameras at Bayfront/Chilco (see Set # 9 below, for more info about Bayfront/Chilco) and a rent of $4950 for the four existing cameras, 9% lower than the price presented the previous week. The City has not publicly acknowledged that it was public input that brought about the 9% reduction, saving $107,400 over the five years. That saving means that the City can issue 1074 fewer tickets and still break even (assuming that the City gets an average of $100 from each ticket issued). Even with the 9% reduction, the City still is paying WAY too much. In March 2014 the City of Elk Grove, California approved a new contract which specified the following schedule of rents for their five RedFlex cameras. Menlo Park will pay 72% too much (compared to the Elk Grove price schedule) over the five years of the extension, $497,184 extra. To cover that extra rent, the City will need to issue an extra 4972 tickets. But there is a way out. At the Aug. 27 meeting the council did not delete the requirement for a 4/5 vote to cancel, but modified it so that after Feb. 15, 2015 only the normal 3/5 vote will be required (see Section 6.1 of the contract). Thus, a simple majority of the council can vote to cancel the program, so that the City can, if they wish, negotiate a better price. RedFlex invoices received here in April 2018 (link in Ticketing Highlights, above) show that the City was continuing to pay $4950 per camera per month. April 9, 2019: Will They Renew? The contract expired on Aug. 30, 2018, but on Aug. 15 the City asked RedFlex to extend it two months. In that letter the city manager said that the contract would come before the council on Sept. 11 - but it didn't. The matter was heard at the Oct. 23 meeting, and the council voted 5 - 0 to extend the contract for six months during which time the contract is to be put out to bid and there is to be an evaluation of the effectiveness of the program. A staff report recommending a five-year extension will be heard at the April 9, 2019 council meeting. Here are some reasons they should have a close look at the program before continuing it. Go to FAQ # 17 for more information about other cities' contracts, and to see how much they pay - and how they negotiated. This list of contracts and amendments was up-to-date as of April 5, 2019. At the Oct. 12, 2011 meeting of the City's Transportation Commission, the police made a presentation about the red light cameras. The video of that meeting is available on the City's website. The City's cameras are located on CalTrans right-of-ways, so are operated under an Encroachment Permit obtained from CalTrans. HighwayRobbery.net obtained these documents from CalTrans, via a public records request. In Nov. 2015 the City applied for a renewal of its Encroachment Permit. Mentioned in that application was that the City intended to continue its effort to obtain a new permit, to put a camera at Bayfront/Chilco. CalTrans eventually approved the Bayfront/Chilco permit and the camera was installed in late 2016. See Set # 9, below. To see how much fine money the Court sends to the City, see the column in the Set # 1 table, above, or - to see the source documents - go to Docs Set # 5 on the San Mateo Docs page. There is program info at the police department's website. Sgt. Sharon Kaufman: "My only question is since most of the violations are right turns, how long would that be sustainable?" Mark Riggs: "I can say that most intersections that have right turns enforced continue to produce consistent numbers." In pages 9 - 12 of the report it presented to the city council for its Aug. 20, 2013 meeting, SaferStreetsLA found no justification for the installation of cameras at Bayfront/Chilco. The staff report is available at the link in Set # 4, above. On Dec. 7, 2016 the city announced that it had installed a camera at Bayfront/Chilco and that enforcement would begin on Dec. 9 - with 30 days of warning tickets. A slide presented during the Aug. 20, 2013 city council meeting disclosed that 90% of the tickets go to visitors. RedFlex' construction work in Menlo Park was the subject of a Prevailing Wage action by the California Department of Industrial Relations. In Dec. 2013 the City withheld $16,879.56 from its payment to RedFlex. By Mar. 2016 the City had returned all but $2806 of that money to RedFlex. State Senator Jerry Hill: In 2010 Sen. Hill was the author of AB 909, which would have reduced the fine for a rolling right violation, and in 2016 tried again via a new bill, SB 986, which also did not pass. In early 2017 Sen. Hill introduced SB 493 which, if it passes, will reduce the fine for a rolling right violation. There may be some more Menlo Park information posted in the next few weeks. Mark your calendar to remind you to come back here and look!